If you are a songwriter/musician/live-music-lover, we invite you to come out to our first Open Mic of the year! We are happy to partner with Brew Coffee Spot to co-host this event for y'all. 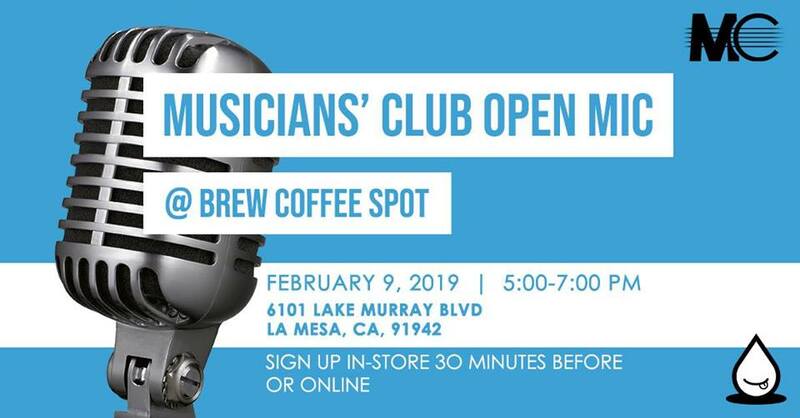 Invite your friends to perform or just hang out with us and enjoy amazing food and drink items from Brew as we support our local music scene and businesses (like Brew) who support our local music scene! Sign up for a 10 minute on the day of by arriving at 4:30pm to put your name down! We will also take online sign ups for those who have time restraints (first come first serve basis, so apply early). Link is below. Please fill out this form if you want to sign up for a performance, and to list any tech requirements you will have (need AUX connection for MP3, do you have an extra mic/can we bring our own, can we bring drums/cajon, etc.). As stated above, you can also show up to Brew by 4:30 to check in and secure a walk in slot! If you arrive at 6:00 or after, we CANNOT guarantee you a performance slot, even if you signed up online, so please arrive early so we can check you in and get you a slot.